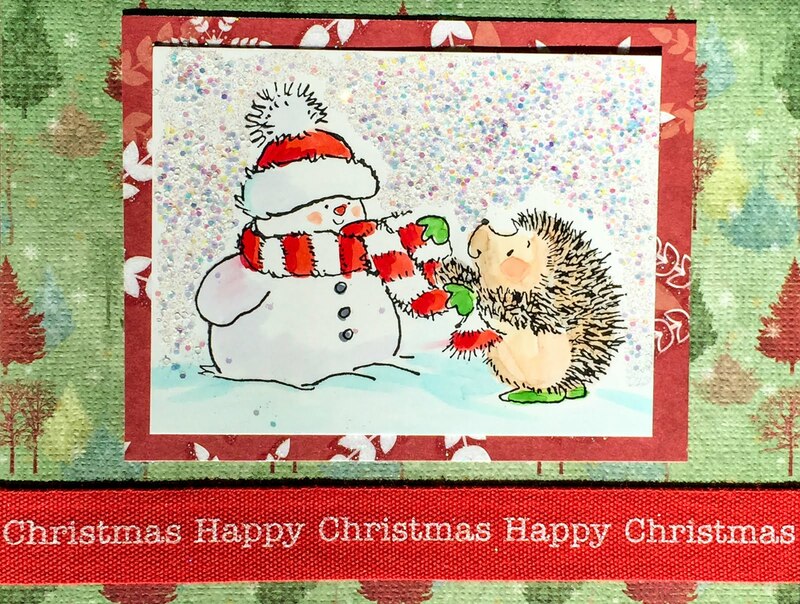 In England, the adorable hedgehog is one of the most beloved of woodland creatures and has been immortalized in literature and art. When we were living in England, I fell under the spell of the hedgehog's cuteness, too. I didn't hesitate to purchase hedgehog paraphernalia, including three perfect Penny Black wood-mounted rubber stamps. The images were stamped onto a glossy white cardstock using Memento Tuxedo Black ink and then were colored and shaded with Copic markers. As you can tell, I am a glitterbug and these cards called out for lots of glittery snow. 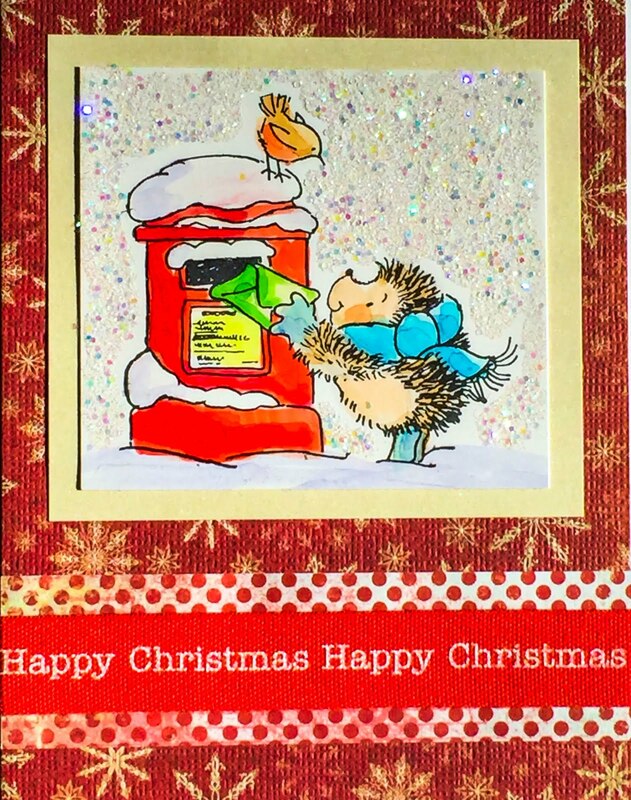 Penny Black's Royal Mail stamp is my favorite, and it features Hedgy and its friend the Robin, another iconic animal of British gardens. 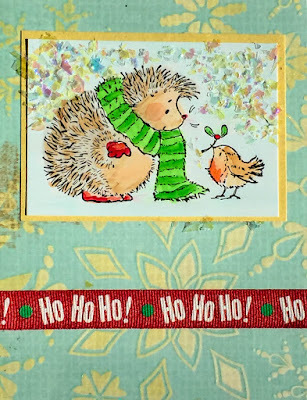 We had many many robins in our back yard, but I never did see a hedgehog up close and personal. We had a family of foxes that made themselves at home in our garden (and under a shed! 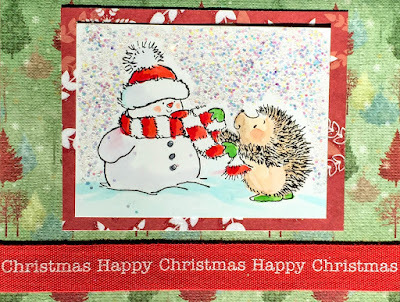 ), but the hedgehogs were very shy. Penny Black's Wishes for Kisses once again pairs Hedgy with his buddy the Robin. And finally, Penny Black's Snowy and Hedgy make a handsome wintry couple. 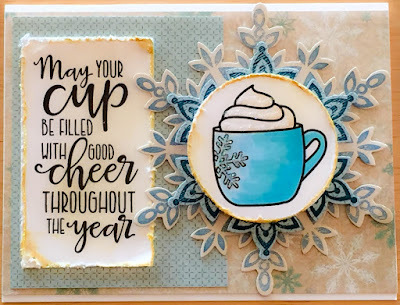 I hope your cup is warm in your hands and your family is close to your heart this Christmas season. 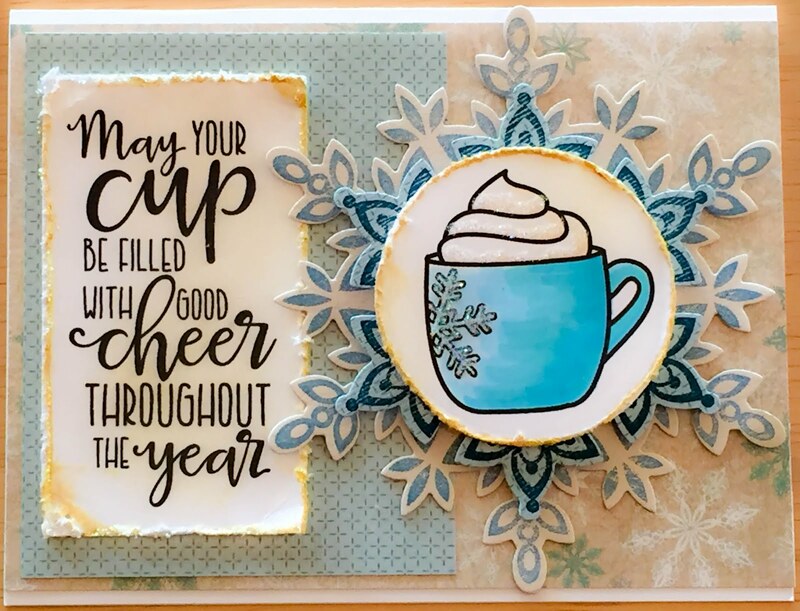 As a card maker, my absolute favorite time of year to create cards is Christmas. 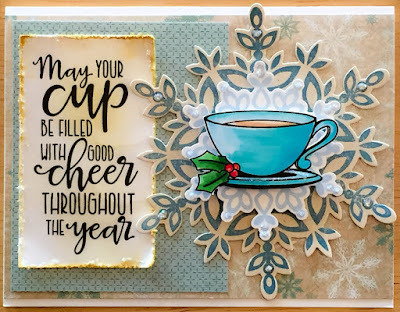 I look for reasons to make even more cards, and I'm happy that we have a group of tea enthusiasts on Facebook who sponsor a Christmas card exchange each year. I had whipped up about 6 different designs and 40 cards already, but I was still short on some to give to family, friends and my tea ladies. Then Julee Tilman, owner and illustrator of Verve Stamps, was incredibly sweet to offer a free digi stamp set of A Cup of Kindness. Oh my gosh, this was the perfect set to use for my tea friends, and I got cracking right away on this project. I used Copic alcohol markers to color these "open" images, which lend themselves to highlights and shading. I followed Julee's sample on her Poetic Artistry Blog as inspiration, including using distress techniques, glitter, and her sentiment from the digi set. 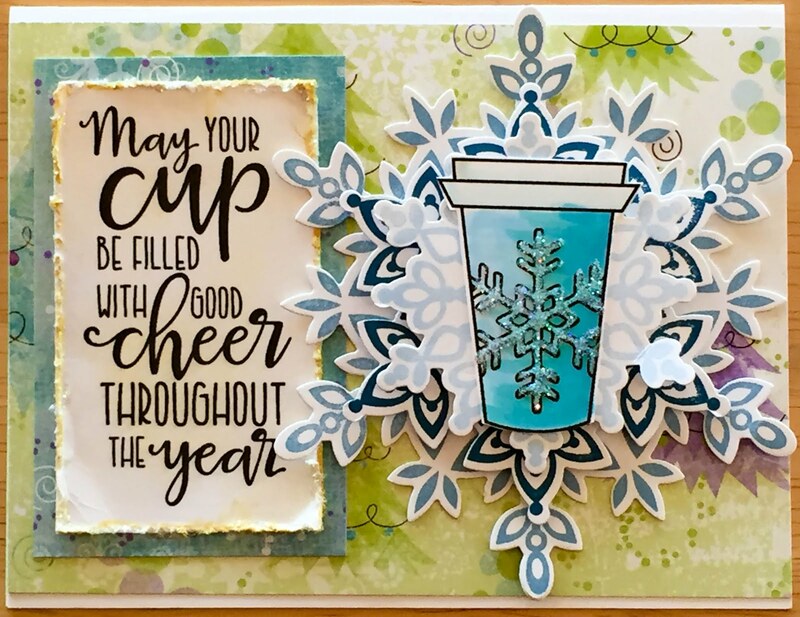 My background snowflake was made with Stampin' Up! 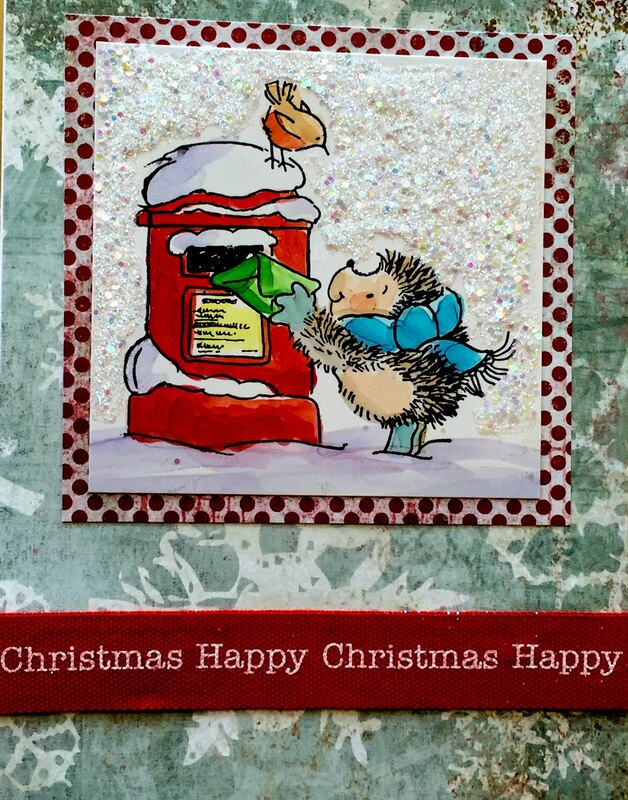 's Festive Flurry Framelits and coordinating stamp set. I think these Cup of Kindness cards are the favorites of my Christmas creations. I just love them. Thanks again, Julee! !